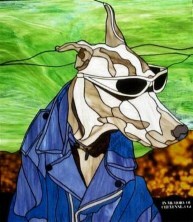 We find that a high percentage of requests for custom stained glass patterns and windows are for beloved pets. Never should the client be satisfied to have just any dog of that breed represented, but always must it look exactly like their best pal. Unfortunately, often the window/pattern is a memorial to that pet and at times the photography you have to work with is not the best. The glass artist must select just what it is in the photo that makes this animal look different from any other of its kind. Some people call it the soul or essence of the animal. We find most of the personality of the pet is found in the eyes. Once you draw the eyes properly and capture them in just the right glass, the rest is muscle structure and glass color choice. When creating a window of an animal we generally figure that if you can't see through it in actuality, use opaque glass, like fur, nose leather, etc. If you can see through it (like the eyes), use a deep cathedral color, always putting in the pupil of the eye and most importantly that glint of light that indicates "life" in the beast. Yes, these are often the smallest pieces in the window but oh so necessary for the dimensionality and personality of the panel. 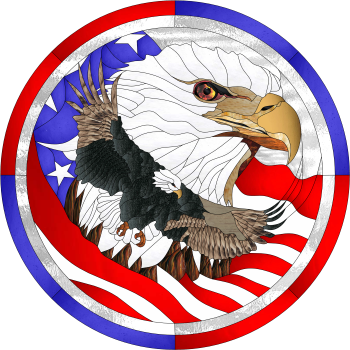 In this month's pattern, we were asked by a client in Utah to create an incredibly patriotic design utilizing the national bird of the USA, the bald eagle. Had we not captured the eye of the major bird, this eagle would not have that regal look. Always remember to use narrowest foil for cut lines in the eyes. Think 5/32" or even narrower. Star cuts are made more easily utilizing a glass saw, preferably a band saw, in order to get the crisp angles without the roundness which a ring saw blade leaves. The flag can be done in either cathedral or opaque glass, but with the white we prefer to keep the red and blue opaque as well. The image below shows a mix. It's totally up to the glass artist to choose. 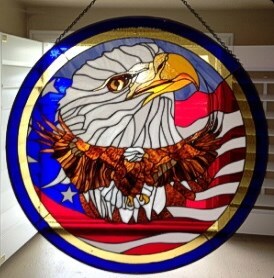 Selecting the glass for a window is the "art" of the "craft." As I mentioned, we are often asked to create memorials for pets. The design below was especially challenging as it was for a 16" stepping stone, forcing the design to be kept simple yet look like the animal it portrayed. The dog's person was very pleased with the finished piece. When designing for small panels/stepping stones, always keep in mind that your smallest pieces will be in the eyes. Draw this part first then size the background to what is actually cuttable to determine how much of the animal will be in the piece and how much of a close-up is required. 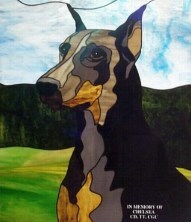 Shading and muscle structure lines define the individual animal as well as give it that three-dimensional look. 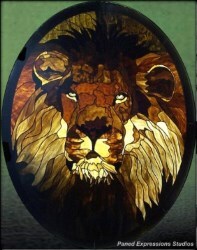 Below, by using such glass choice effects, the nose of the lion seems to protrude beyond the confines of the panel and the eyes drill through you. Probably your biggest problem, once you've captured the look of the animal in the pattern, will be glass choice for long-haired or short-haired creatures. Always be aware of the "direction" of the glass you choose as this will determine the "flow" of the fur. Glass Eye 2000 Professional Plus Edition allows you to move the glass to the part of the glass sheet you need for just the right effect and to turn it to get that fur moving well. This feature will go a long way to getting fewer revisions from the client and nailing that design the first time out. 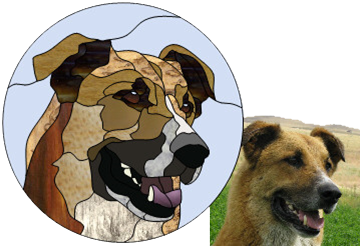 Paned Expressions Studios opened in 1979 and has been creating patterns and custom finished glass art commissions throughout the years. 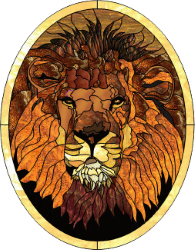 They have always felt that stained glass is fine art and not only a craft and this attention to detail shows in their work. In windows, mosaics, fired paints, and etch/carve, they strive to achieve the realism that is the signature of their creations. In 1997, their talents became available to other studios and to hobbyists through their custom pattern design service. In 2003, they compiled many of their designs into pattern collections which are now available in several computer formats for ease of print. They now offer a new feature of individual downloadable patterns in three formats.